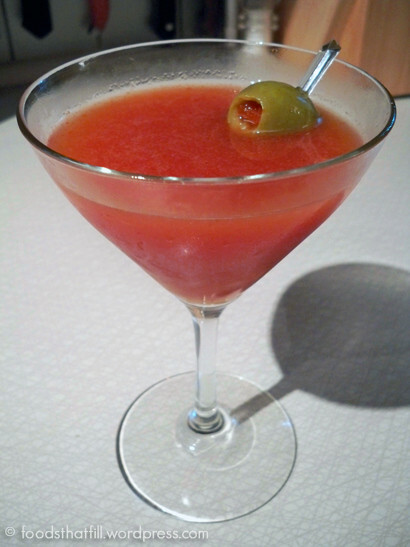 The Bloody Mary Martini is a bloody martini recipe of sorts. I created it one evening when I felt a bit too full for a complete Bloody Mary, but craved the rich goodness of all that flavor. This bloody Mary martini recipe, or Dirty Mary, as my friends have come to call her, is an excellent evening cocktail. It offers all the spicy and savory flavors of a bloody Mary, but presents in a more sophisticated manner. It’s delicious, less filling, but quite potent! Like any good bloody Mary martini, it starts by chilling a martini glass. Fill it with ice and water while you mix the drink. Pour bacon infused vodka over peppered ice cubes, but any good quality vodka will do. Add a dash of Worcestershire, a pinch of cayenne, and an ounce of Clamato shaken profusely and strained into a martini glass rimmed with Parmesan and celery salt. Garnish with a roll of honey smoked ham. Feel free to let your artistic side go wild with garnish ideas. In fact, I’d love to hear your ideas on the Bloody Mary Recipe Forum. The Bloody Martini also works well with gin substituted for vodka, if you’re partial to gin, that is. If you’re not a fan of Clamato juice cocktail, try using V-8 juice cocktail for a fresh flavor.